What can skyrmions do for you? These ghostly quantum rings, heretofore glimpsed only under extreme laboratory conditions, just might be the basis for a new type of computer memory that never loses its grip on the data it stores. Now, thanks to a research team including scientists from the National Institute of Standards and Technology (NIST),* the exotic ring-shaped magnetic effects have been coaxed out of the physicist’s deepfreeze with a straightforward method that creates magnetic skyrmions under ambient room conditions. 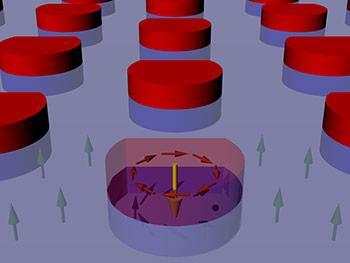 The achievement brings skyrmions a step closer for use in real-world data storage as well as other novel magnetic and electronic technologies. It took a trip to NIST to confirm the skyrmions’ existence. Creating them involves placing arrays of tiny magnetized cobalt disks atop a thin film made of cobalt and palladium; the NIST Center for Neutron Research (NCNR) had just developed a state-of-art polarized neutron reflectometer that was well suited to study their lab results. Working with NCNR scientists, the team used neutrons to see through the disk to spot the skyrmions underneath. The team also captured images of the whirling configurations in the disk array at NIST’s Center for Nanoscale Science and Technology (CNST) and Lawrence Berkeley Laboratory. This work was published in Nature Communications.